LANGUAGE AND THE LAW: LINGUISTIC INEQUALITY IN AMERICA, by Douglas A. Kibbee. Cambridge, United Kingdom: Cambridge University Press, 2016. 240pp. $30.99. ISBN: 978-1-107-02531-8. ISBN: 978-1-107-62311-8. Reviewed by Sixuan Lu, Tianjin University Law School. Email: alex870621@vip.163.com. 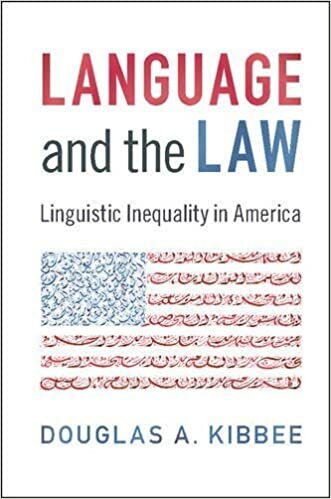 In his book LANGUAGE AND THE LAW: LINGUISTIC INEQUALITY IN AMERICA, Professor Kibbee provides comprehensive statutory and case law analysis for readers to understand the complicated relationships between language and equality, democracy, the legal system, education, government, and employment. This book review will introduce the summary of each chapter and subsequently give personal opinions. In Chapter One, the author establishes the big picture of potential linguistic inequity and fairness issues by defining discrimination (pp. 3-4), providing a short history of relevant human rights in the international tradition and the American tradition (pp. 4-12), and explaining groups, classes and classifications (pp. 12-18). He states that the language is frequently considered under the rubric of national origin rather than of race (p.18). The author suggests the Privileges and Immunities Clause, the Due Process Clause, and the Equal Protection Clause of the U.S. Constitution might be useful for understanding linguistic discrimination (pp. 19-32). The second chapter mainly addresses voter identification and registration as restrictions which aim to suppress minority language speakers’ participation in the electoral process. This serves an anti-democratic purpose, especially on the assumption that knowledge of English has no guaranty against voting in ignorance, or against manipulation by demagoguery, or direct voter fraud (p. 36). Chapter Three explains the unfair legal system for linguistic minorities particularly for interpreters (pp. 54-68) and jury members (pp. 68-82). Those who speak English as a second language need special services at every stage of the legal process including not only litigation for criminal, civil, and administrative cases, but also interacting with police or other agencies (p. 55). Impartiality raises two issues with language: first on the exclusion of linguistic minorities from the jury pool, and secondly on the ability of a juror to comprehend non-English testimony (p. 68). Chapter Four discusses language and education issues including segregation (pp. 102-29), indigenous language education (pp. 132-40), and dialect languages (pp. 140-45). As Kibbee argues, linguistic differences cause unresolved inequalities not just in education but also economically, politically, and societally, where education alone cannot solve all these inequities (p. 145). Due to the global competition in the world, the economic pressures to learn English discourage true bilingualism because maintaining native language seems counterproductive (p. 195). Chapter Five gives a long history of federal and state governments offering multilingual information and services, e.g. official records (p. 146). This part significantly stresses on driver’s license exams being required for voting (pp. 154-57), meaningful notice to provide communication of legal actions (pp. 157-59), and medical care that most distinguishes American society from other developed countries (pp. 159-63). Kibbee makes the case that because lawful permanent residents pay taxes in the U.S., they should have a reasonable expectation of multilingual information and services (p. 163). Chapter Seven summarizes the conclusions drawn from the previous six chapters but fails to propose possible resolutions. The author could have used the comparative research to borrow some good lessons from other countries such as Switzerland, the Netherlands, Italy, Spain, Australia, France, Canada, the United Kingdom, and Germany,which accept large number of immigrants. By only scratching the surface, this book could have articulated further on efficient and economic considerations on addressing the relevant issues. For instance, the last paragraph of Chapter Three admits that common law system requires a balance between philosophy and practicality (p. 82). This point could have been made clearer by saying that efficiency and economic judiciousness could be the key to creating a balance. Moreover, Chapter Four suggests that cost and the availability of appropriately prepared teachers are issues that have evolved from the Bilingual Education Act (p. 120). The author could have discussed how public education as a resource cannot satisfy unlimited and unreasonable requests from society. According to the book’s publication information page, Library of Congress Subject Headings and Book Industry Standards and Communications Subject Headings classify this book as a linguistic book but not a legal book, so its intended audience might not have legal background to know the federal and state dual legal system and the hierarchy of law in the U.S. Introducing the relevant information would help the readers without legal training to understand the contents, and organizing the statutory and case law authorities according to the hierarchy of law would make the reasoning more persuasive. A lingering question after reading this book is whether law can solve all the issues that are involved with the minority language. The answer is undisputedly: no. For example, Chapter Four states that the courts did not want to sort out the conflicting claims of educational professionals on multi-language tests (p. 126), which is a typical attitude when the courts face questions they believe they are not in the position to solve purely by law. It might look like dodging a bullet, but the reality is that we cannot deem law as the skeleton key to every single social problem. © Copyright 2018 by author, Sixuan Lu.